Our first taste of Tunisia came while standing in 2 lines at Palermo's port for over an hour and a half--one line to convert our ferry tickets to boarding passes and a second line to clear immigration. It was a very Mediterranean process, one that transitioned from the chaos and ethics of southern Italy to that of Tunisia. At the front of the line, it was that 'one-down' type of queue where the message is that you are subservient, that you only go when we say you can go. Everywhere else in line, it was a free for all. Clearing airport security these days certainly makes one feel like cattle, but at least the surroundings are fresh and modern and there is some assurance of equity in the process. None of that in Palermo. Instead we were pressed against a rough brick wall outdoors, jockeying for position in a mob. The line didn't advance for a half hour; here we waited until the seemingly arbitrary process advanced us. It was clear: we had few rights or recourse or consideration, unlike in similar situations in more northern countries. And as we'd learned in Egypt, if we didn't rally and sustain our passive-aggressive behavior at a high level to hold our own in the unmoving or moving line, we'd be there even longer. The searing headaches from the plumes of the more potent second hand smoke while in line alluded to transitioning into a new, different culture. So too did the presence of women in headscarves, some of whom spontaneously formed a "women's line" at the second queue. Both their scarves and their special line were markers for the Muslin culture that we had encountered in Egypt. A deeply fatigued tiny car packed to the gills on the inside and top-loaded on the outside with a side-lying motorcycle and multi-colored used kid's bike moved by us to join its special line. Its heavy burden reminded us of the one-way flow of used luxury goods from Europe to its east and south. 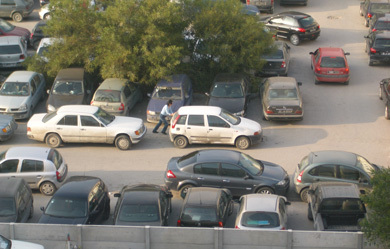 That groaning car and others like it further indicated that Tunisia would look and feel very different from Italy. 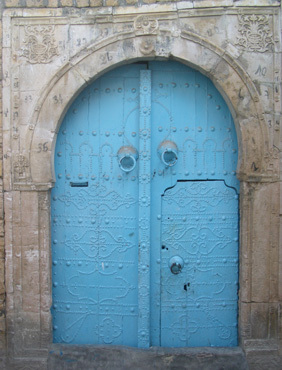 & looking instead at the intricate Tunisian doors. Though the rough competition in the lines was stereotypically Italian, there was a new politeness interspersed that reminded me of our guide book's comment that the Tunisians were nice people. The man ahead of me immediately apologized when he turned and realized that the forearm blocking his chest-height elbowing was that of a woman. And when the custom's man made inquiries more quickly in Italian than I could respond to, one of the Tunisian men replied for me: "Yes, she's been standing in the regular line for a long time, no she's not understanding anything you are saying (not exactly true), and she speaks English". It was a welcome bit of care-taking from a man with whom I'd been competing for space. Once we finally boarded our overnight ferry, we saw a second slice of Tunisia in Italy as our ticket saleswoman had said most of the passengers that night would be Tunisian. The group of 4 middle-aged women picnicking at the next table in the lounge looked relaxed and assured. Three of the 4 had head scarves, though I guessed that 1 didn't usually wear a scarf because she kept fussing with it--Muslim women who are deeply committed to their scarves practically have them stapled to their heads. They also didn't have the tightly contained look of Muslim women in Egypt or Ankara, a bastion of traditional Islam in Turkey. They were animated and moved with the sense of confidence and entitlement of modern European women. The sight of their ease boded well for my own experience in their country. Though the persistent headaches from the passive smoking while unhappily spending too much time in line was annoying, this first taste of Tunisia while still in Italy left us intrigued and excited to be headed to this foreign land. Despite the free-for-all Italian queue, the manner of some of the people within the line was comforting and reassuring and we already felt welcome as tourists. Entering Tunisia after we docked at Tunis triggered the same subservient feelings that the boarding process in Palermo triggered, only worse. We felt like we were running a pinball-type gauntlet without knowing the rules. We needed to flash our passports even before heading towards the corridors to leave the boat. Once off the boat we mistakenly thought we had some breathing room before hitting the formal entry process indoors. We were trudging along the asphalt pedestrian way in the early morning light in a loose cluster of a dozen other passengers when a gruff official with a dog started shouting at us. We initially ignored him as it was unfamiliar and didn't seem directed as us. We were clueless as to what was happening and were among the last to 'get it' that we were to halt, drop our suitcases, backpacks, and fanny packs to the ground and vacate the immediate area. The only thing that registered in my mind was that he was about to detonate something because of the way we were directed to stand back, way back, from the abandoned possessions. Soon it became clear: the dog was to be undistracted as he sniffed each bag. But the dog was less focused than his handler, as he whizzed by the last of the bags without as much as a whiff. His performance was good enough though, we were allowed to pick up our belongings and continue on without any big bangs. We'd been in no hurry to join the mob scene in leaving the boat so when we had to go to the rear of the first immigrations line because we lacked a form, it didn't cost us too much time. The pile of forms at the back of the room had no sign over them--you had to know to get one and none of our fellow tourists got it right the first time either. Luckily for us the multilingual Swiss man behind us was able to translate the more obscure parts of the Arabic/French form. We were quite surprised to then go through the airport security-type inspection process in which our bags and bodies scanned. I wondered if I was being abused a bit for being an infidel as the female security guard began her scan of me with both her hands rammed squarely on my breasts--a first and a seemingly pointless maneuver. Next up was another form to complete and a baggage inspection line. As we twirled about trying to determine the processing sequence, the younger Tunisian man who had spoken for me the night before in the Italian immigrations line deftly delivered the form to me without time for a thank-you. Again, it was nice to know that some people were already looking out for us. though this time we were clueless as to what to do with the Arabic-only form. When we finally made it beyond the glassed-in immigrations and security area with our suitcase zippers ajar, our well-inspected passports ruffled, and stubs from new forms in hand we brushed by the aggressive taxi-touts to sit for a few minutes. We could have pressed on but we are learning to pause after such unsettling experiences to regain our focus and to make mental notes as to what to do differently next time. Tossing the bag of acidophilus bacteria capsules used to ward-off stomach infections in my suitcase at the last moment had definitely been a mistake as the luggage inspection official grabbed them first and inspected them closely. "Busted for bugs" was my only thought as he brought the bag to nose level as he peered harder at the granules. "For the stomach" was plausible enough and he went on after a tense moment. The little freebie Qantas zipper bags were surprisingly suspicious to him and we'll tuck them and other special looking bags inside something larger next time. Having had our stash of carrots in a clear plastic bag instead of an opaque one might of more quickly signaled to him that we weren't whiskey smugglers, so we may make a point to demonstrate our boringness in such a way in the future. Our Lonely Planet guide book had warned of the price gauging by cab drivers at the airport and Bill was ready for their scams at the seaport. In Cairo we wore ourselves out walking, taking the bus, and then walking again way-too-far to avoid the taxi scams, so we decided to take them on in Tunis. The taxis were supposed to run on the meter but drivers were known to have fiddled with them, so Bill asked for a price estimate to our hotel. (We learned the hard way that there is no such thing as an estimate; the price given then became a fixed price.) Twenty dinars, close to $20, which was more than quadruple the expected cost, was the estimate from the driver who had pounced on us as we cleared security. After some polite banter with the driver as we walked out off the port building to the parking lot, Bill quickly approached another driver and asked for a price. It was touch and go as we could see the irritated first driver was announcing to the others what had happened and we assumed the price was being fixed in the sea of waiting drivers before our eyes. Driver #2 that Bill had approached countered with half the price and loaded our 2 suitcases into his trunk under the scowls of the small crowd of drivers and non-drivers. We were happy to duck into the slight shielding that the cab provided and our driver successfully communicated to us that 'those were not his colleagues' which was easy to believe. Bill guessed that he didn't regularly work the port tourists but was waiting for customers for his return trip into the city. We had still overpaid, but under the circumstances, felt we'd gotten the best deal we could. And indeed, our return trip to the port in 3 weeks only cost 4 dinars. It was only 9 am when we dropped our bags at the Tunis hotel so we headed into the Medina, the old city, for our head-first immersion into Tunisian culture. It wasn't long and we were repeatedly hearing the exact script described in our guide book: "The exhibition of the women making the traditional incense/rugs will be over in 30/60 minutes. We must hurry. Today is the last day of this special week-long festival." The friendly man then guided us through the Medina to the store front which we would go through to the back to see the women making the special product. We declined to step in and walked on as we knew it was a come-on for getting us into their shop for a hard-sell pitch. Amazingly, the touts stayed behind as we walked away from the store front. We saw blue & white paint everywhere we looked outdoors. We swallowed the bait 3 times, knowing each time that it was a trap, but each time hopping that there was some grain of truth to it and also wanting to have the complete experience of a Tunis tourist. It was a game for us to play--but on our terms. Touts #2 and #3 had sweetened the pot by describing the fantastic view from the government shop where nothing was for sale, things were only to be looked at. We thought it worth the effort in case the view materialized, but were only willing to go as far as the shop doorstep. We knew from one similar experience in Cairo that the entanglement factor dramatically escalated once we stepped across the threshold. The other line that we heard from men walking in our direction on the street was "I saw you at the hotel--I work there--that is why I am talking to you." "Uh-huh" was our response. I bit the first time, thinking it was true and that he was one of those nice Tunisians I read about, though Bill immediately questioned it. The encounter went nowhere with the first man but several other men used it as a lead in to "The special exhibition in the Medina today will close soon....."
A couple of chatty men approached us and in the course of the conversation asked where we were staying. We make it a policy not to tell people the name of our hotel when asked and usually feigning to not remember the name is good enough, but not in Tunis. We quickly decided to select another hotel in our neighborhood for a credible but defensive reply when asked about our hotel from the other touts. These Tunis touts, like the touts in Egypt, spoke good English, were well dressed, very smooth, very credible, and personable. Most included in their banter as we walked along: "My sister/cousin lives in Boston/Chicago and is a cardiologist/teacher there. I was there once." Fortunately for us the touts in Tunis weren't as numerous and were much easier to ditch that in Egypt. The Egyptian touts seemed prepared to heckle us all day. 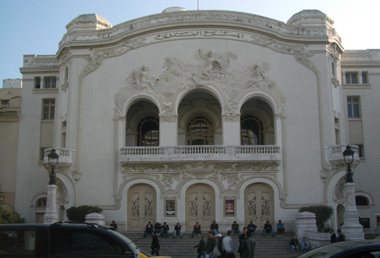 However it was sometimes tough to correctly peg a tout in Tunis because the Tunisians are nice people and occasionally such a conversation was legitimate and we hated discovering that we'd been in "Tout repelling mode" with a person who really did have a friend living in Seattle. 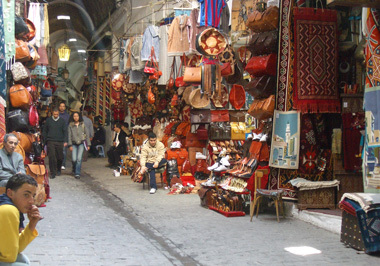 We were pleased that though the retail shops of the modern city were closed on Sunday that the street markets in and around the old town were bustling. There we got our training on being in close quarters with this particular Muslim community. "No touching" was still the rule as in Egypt, but it wasn't as strict. It was OK to have bumped or be bumped, but an apology must follow. In Egypt it just wasn't done unless it was aggressive and then there was not apology; in Italy contact on the sidewalks is the norm and apologies only come out it if was especially forceful. We were surprised however to see a half dozen young couples in the park where we picnicked with an arm over a shoulder, so some opposite-gender touching was allowed, at least in the new city part of Tunis. The people in Tunis were friendly. Only the touts initiated contact with us but anyone we approached in a shop was immediately at our service, whether we had a common language or not. The man from whom we bought a single needle and spool of black thread had the most charming, earnest smile as he dredged up his perfectly spoken, product-specific English words. His was the kind of person I wished we'd be buying our daily ration of bread from. The young man in the tiny store who was chopping chickens apparently thought we weren't being waited on promptly enough as I watched him send a few words and gestures to a clerk across the U-shaped counter who was soon pulling our items off the shelf. And when we paused after paying for a bottle of water in another shop the young clerk overheard our pronunciation discussion and re-explained the price he quoted so we could advance our French. The green grocer wasn't some one we'd seek out again but he was careful to write down the price for each of our purchases, a first in our overseas shopping experiences. 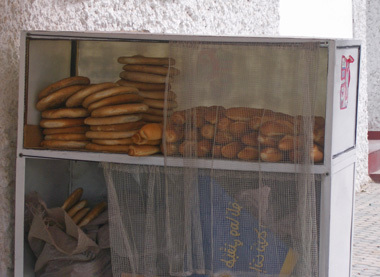 Bread vending on the street. Our first hours of immersing ourselves in Tunis were stressful though. Analyzing and decoding the cultural behavior on the fly is taxing as is being in the press of people in a foreign culture. The Arabic/French signs made it easier than being in Egypt where there was no intermediate language for us. But our French is meager and heavily overlaid with more recent experiences with German and Italian, so it was stressful to have even brief purchasing interactions occurring in French. It was entirely unpredictable which Tunisians knew some English: the middle-aged man selling sewing notions did; the young man selling cell phones did not. One unexpected aspect of our first hours milling in the Sunday crowds of Tunis was being stared at. We both noticed it and found ourselves repeatedly checking ourselves and each other for something to explain the odd looks. There was nothing obvious: we were both properly modest with our sufficiently loose fitting clothes and minimal exposed flesh. We were careful not to touch each other or make any public display of affection. We stayed close to each other so it was clear that I was attached to a man. We were perplexed, as there was no toilet paper hanging out the back, no odd strings or things hanging down the front. After doing a careful inventory of our accessories and garments we realized that there was nothing ordinary about our standard outfits that blend well with Europeans (except for our out-of-season sandals). locked without setting the brake & rolled out of the way by other drivers. Nobody but nobody was using a fanny pack or backpack, though we would see school kids with backpacks the next day. Nobody was wearing fleece type fabrics like my shirt or Bill's vest. Nobody was wearing sandals and certainly no one wore a sunhat, though taking it off reduced the snickers but not the stares. The best we could conclude was that we were obviously foreign tourists and there weren't all that many of them in Tunis now, or perhaps ever. Bill remembered that the big draw for Europeans is the beaches and that there were big tourist compounds well beyond the city, so tourists might be a spectacle in the city. Foreign women are exempted from rigidly compiling with Islamic law but that exclusion also makes them 'open season' so, despite my gray hairs, just being a foreign female may have been reason enough to stare. Bill was more concerned about the staring by the end of the day than I was. I more habitually scan and survey street scenes for their safety as a woman and I never felt unsafe. I certainly felt like I didn't have a stitch of privacy on the streets, but there was absolutely no intimidation in the staring--it just felt rude by our standards. We headed out the second day with some attire changes to test out the assumption that the unrelenting stares were for no better reason than our novelty value and it seemed a sufficient explanation. We did vow however to be quick to ask if the opportunity arose to get feedback on our presentation from a local--an opportunity that was unlikely to arise but that we'd be ready for, just in case. 'Bedsheet woman with 2 corners of the wrap held between her teeth. It was easy to believe our guide book's comment that Tunisia is the most liberal of the Muslim countries. At the end of our first day Bill noted that we hadn't heard the call to prayer once while in the city--something that should have occurred at least a couple of times in our time exploring the city. We also hadn't seen any merchants or other men pausing to whip out their prayer rugs and perform the 5-times per day ritual--something we routinely saw on sidewalks and in shops in Egypt. Men were protective of the mosque however as several times when we were headed towards it in the Medina we were politely directed to go the other way--something we didn't always do. The dress of the women certainly reminded us where we were as many women covered their heads to some degree with a scarf. Only a couple when so far as to wear concealing gloves and none covered their faces. It was here that we first saw older women adding what looked like an ivory white table cloth to their outfits, often worn wrapped around their torsos with the other end over their head and then held in their teeth. Essentially all the women conformed to the minimum exposed flesh dress code in which just the face, a bit of neck, and hands were uncovered--a look that for me is associated with cool weather. The vast majority were in casual western dress, like pants and tunic-length sweaters or jackets, often very form-fitting. On the promenading street of the modern city I counted four 20-something women flashing a bit of knee between their high boots and longish skirts, but always with stockings. A rare young women had a neckline lower than her throat and none were wearing short sleeves though the shaded streets could be cool. 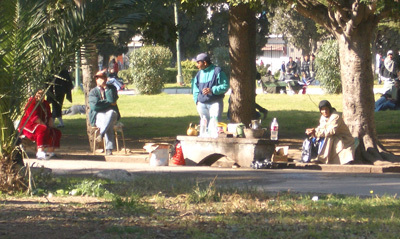 A vendor brewing tea on charcoal in a metal pot in a Tunis park. The Mediterranean culture blended with the Muslim influences, especially in the manifestation of the 'idle man' syndrome. Men vastly outnumbered the women sitting in sidewalk cafes with their chairs strategically arranged for staring at the passersby instead of their companions at the table. We can imagine that some of these men spend most of their waking hours doing nothing but sipping coffee and tea and smoking cigarettes from their favorite outpost. Too many of these idle men dragged on their cigarettes like their lives depended upon it--a rare sight in the States these days. These were the cheek hollowing, long sucking inhales that are accompanied by a holding-in of the smoke and perhaps finally letting it exit out their noses. Women were out in force in the open market areas but their numbers quickly dropped as we moved away from the shops that supporting homemaking chores. I reflexively clutched a bit on some streets where I felt like the only woman around for miles as I associate the lack of women on a street as a signal that it might be unsafe for me. A bit of Art Deco in downtown Tunis. 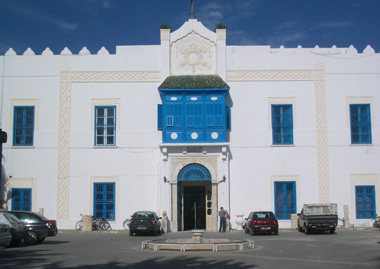 The white stucco buildings with light blue trim reminded us of Greece, though the details on the continuum towards Art Deco seemed to reveal the French or more European influence. Tunis was generally cleaner than many Mediterranean cities, though the street sweepers with their brooms and dustpans seemed to get behind in some areas. The stench on a couple of stretches of the streets adjacent to the main boulevard went beyond the usual Mediterranean garbage problem. Tunis is a bustling, modern city but there were constant reminders that it is the capital city of a poorer land. The antiquated trams that noisily plied the streets of Tunis reminded us of the rickety trams in Cairo in which the driver would occasionally hop out to switch the tracks with a crowbar, though that maneuver appeared to be automated in Tunis. 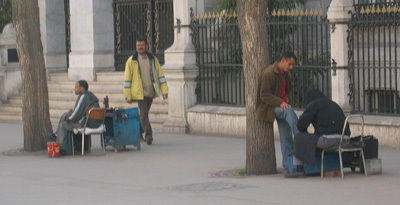 Shoe shining in Tunis: the customer leans on the street tree. Another reminder of the 'developing' nature of the economy was too many men being engaged in meager occupations made worse by too few customers, jobs like reheeling shoes and shining shoes from the tiniest of stands. We finally realized why the dozen shoe shiners on each of several city blocks appeared to be so evenly spaced: they were each aligned with a street tree. The man shining shoes sat in a chair while the client stood leaning his back against the tree with 1 foot up on the low workbench. Over by the train station the shiners had freestanding operations with 2 chairs, but not on many of the other streets. We also saw the occasional man with a bathroom scale offering pedestrians the opportunity to weigh themselves for less than 10 cents (US$). In and around the Medina street market were rows and rows of vendors selling used clothes piled in overwhelming heaps on makeshift tables with cardboard tops or on the ground. The clothes all looked clean and in good repair, but what a chaotic mess from which to make a selection. 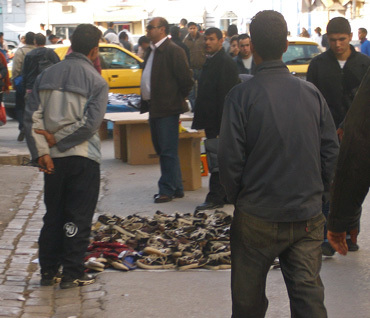 Few of the piles of used shoes were in matched pairs, guaranteeing more hard work to get that bargain. It wasn't hard to imagine that many of the people we saw on the streets had assembled their outfits from these taxing piles of garments and shoes. We peeked at labels trying to imagine the distribution network that was funneling boat-loads of clean, used European garb into North Africa. Standing packed-in with the commuters for a half hour on the train from Carthage to Tunis's city center reminded me of another marker of an emerging economy--the shorter stature of the people. At 5'8" and 5'4", Bill and I are exactly average height for Americans of our generation, with the younger males and females in the States being taller. Here, regardless of the generation, Bill and I were taller than the average Tunisian. Yes, there were those who towered over us, but not so many as at home or in Europe. It was a sure sign of poverty taking its toll in terms of poorer general nutrition. Used shoes for sale, literally in the street. Our 3 star Tunis hotel was in an aging modern building. The welcome bathtub had long ago lost its gleam and the tile floors were showing the wear from daily scrubbing. The hotel was kept very clean by a fleet of housekeeping women but like the city, it cried out for more serious maintenance. Bill shoved the separating parts of one of our chairs together each day and we ignored the tears in the bedspread and sheets. The poor reception on the satellite TV made for challenging viewing but the newer, relatively sound-proof windows were welcome. An apparent shortage of linens had the staff coming to the room to collect the towels shortly after their arrival for work and replacing them around lunch time. I knew little about Tunisia when it came up as a possible late-winter destination during last fall's planning discussions. I knew it held real estate on the African coast of the Mediterranean, which was a good location for staving off some of the winter chill in February. But that tidbit and that it was a small Muslim country was about all that come on screen for me with the mention of Tunisia. But Bill flooded my screen by saying "Carthage." Carthage, which is in what is now Tunisia, was the western strong hold of those illusive Phoenicians we often read about but of which we only occasionally saw fragments. Now that would be exciting, even though I knew Carthage had been deliberately trashed by the Romans. If the mention of Carthage doesn't ring your bell, what about Hannibal? Some consider him the finest military leader in history. Hannibal was a Phoenician and Carthage was his home. He was the one who crossed the Alps with elephants and almost destroyed the Roman Empire in the Second Punic War a little before 200 bce. There would be no mention of him at Carthage itself, but his legacy added weight to the experience. The Phoenicians of the Mediterranean, like the Celts of central Europe, were significant early players in pre-Christian times. But both have been difficult to learn about through our standard 'road scholars' study materials of museums and archeological sites. Both cultures traveled far and wide, but little remains to be seen of either. The Celts weren't great stone masons and building in wood leaves the slightest of traces, if any at all. The Celts were noted for spreading iron technology around Europe, so most of what one actually sees of them is their metal work. 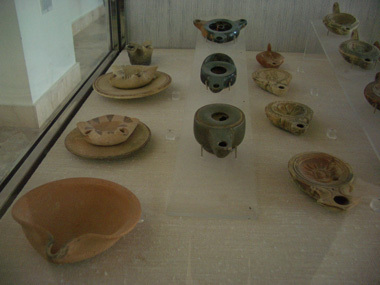 Oil burning lamps, from left to right: Punic, Greek, & Roman. In contrast to the illusive Celts, the illusive Phoenicians' specialty wasn't making things in stone or metal, they excelled at commerce. The Phoenicians were the long-haul truckers of the ancient world. While others of their time carried amber and salt on their backs and on pack animals through treacherous Alpine passes and across hostile lands, the Phoenicians whisked the same goods around the Mediterranean in sleek boats. Evidence of the Phoenicians is often inferred by the presence of fine ceramics or obsidian found hundreds or thousands of miles from its place of origin--products not made by them but transported by them. We've repeatedly seen those bits and pieces that are a testament to the flourishing commerce of Phoenicians in museums throughout Europe and in Egypt. And in both Istanbul and Spain we saw huge stone sarcophagi, or coffins, of Phoenician origin. Those weighty objects reminded us that though they were sea merchants, the Phoenicians also had a landlubber side. To support their trading operations, the Phoenicians very carefully selected natural ports around the Med with very specific criteria in mind. They liked very well sheltered harbors and they often created a trading colony near an established community that already had roads funneling in goods from the hinterland. A Phoenician residential quarter leveled for a Roman forum. The Phoenicians homeland was the Levant, the much contested land around Syria and Lebanon. For more than a 1000 years Tyre was their home base. The center of their operations started shifting west and by 1100 bce they had several settlements in Tunisia. The active silver mines of Spain was increasing their need for more trading posts along their east-west sea route. Carthage was established around 800 bce to counter the increasing Greek presence in the region, including in Sicily. Back in the Levant, the Phoenicians were being diminished by Assyrian attacks in the 7th and 6th centuries, making the Carthaginian base of operations even more important. By the end of the 6th c bce, Carthage was the new center of the Phoenician world and it was the main power in the western Mediterranean. By about 300 bce the Carthaginians were at odds with the other regional powers for control of North Africa and several islands, including Sicily. Wars continued until their final demise at the hands of the Romans in 146 bce. 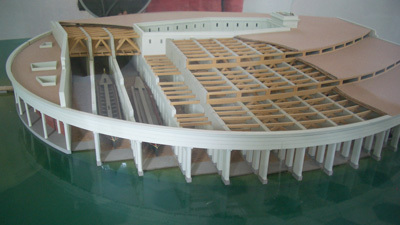 A model of the covered Phoenician ship shed in the artificial harbor. The most stunning sights during our Carthage visit weren't physical ruins at all but a modern model and a drawing of their port as it stood about 146 bce when the Romans buried it. Not surprisingly, the grandest ruins at Carthage were of the Romans. Though intent on dismantling the Phoenicians, the Romans weren't quick to capitalize on their new acquisition. It was another hundred years before the Romans developed this new asset, but it became a gem. At one point the region was supplying 60% of the Empire's grain requirements. 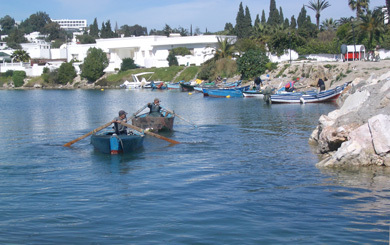 Ancient Carthage's military harbor as it looks today. We consider ourselves well-versed in Roman ruins--we may not know everything there is to know about what we are seeing, but we've seen a lot of them. But we continue visiting them in hopes of seeing something new and we certainly did in Tunisia, both at Carthage and later at Dougga. 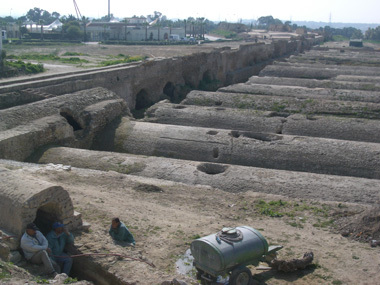 The Roman new feature was the massive water cistern systems. We'd walked in the huge subterranean cistern system in Istanbul but it was just as startling to see the massive system from above ground outside Tunis. These cisterns were enormous concrete (yes, the Romans developed hydraulic cement) Quonset-hut cisterns laid out in neat rows, like a series of side-by-side tunnels. Though simple and repetitive in design, it again underscored the confidence of the Roman engineers. And well-founded confidence it was too as much of the cistern system was still intact. The condition of the displays at the archeological sites seemed to tell a similar story as the rest of Tunis, that there seemed to have been a heyday 20 or 30 years ago and then it stopped. Many of the best displays at the sites and at some of the museums were the work of a German or American university in the 1970's or 1980's. Even one large model at the seaside Roman baths a Carthage was a donation of a British travel club though it lacked a date. The tourists sites, like the city, seemed to have had an influx of resources that then dried up. Modern workers resting at the ancient Roman cistern field. Even in modern Carthage, which I later read was home to the "rich, important Tunisians", the prosperity difference wasn't obvious. We walked many of the residential streets of Carthage, especially those near the sea, as we visited a number of historic sites. We did notice it was more tranquil as it in many suburbs because of the minimal car and foot traffic on the side streets but we had missed that it was prestigious. It was only the presence of foreign flags over some residents that alerted us, that revealed them as embassy compounds. As we got closer, the bored armed guard out front validated what we read on the brass plaques. The certain opulence of these nests didn't extend to the street as they were surrounded by the same familiar white stucco walls and unremarkable landscaping as many other dwellings. Even the massive presidential palace looked ordinary in its details from the street. The sidewalks around the prestige areas were just as treacherous to traverse as in Tunis and the pavement and lighting received no special treatment. The contrasts could hardly have been greater: we had been making our rounds for a second day through the various pay-to-enter historical sites documenting the Phoenician and then Roman history of Carthage and then we passed through the free gates of the American WWII cemetery. We'd been immersed in the details of local life from 800 bce until 500 ce and then bam! we were in the African theatre of WWII. Old footage in our minds of Rommel and the Normandy landing displaced the newly formed images of sleek, shallow-bottomed Phoenician warships that dropped their sails and used oars when in battle against the Romans. 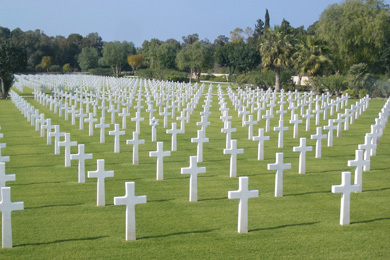 A portion of the 2,841burials at the North Africa American Cemetery. The land of Tunis and its suburb, Carthage, was already dusty and dry in mid-February but the American military cemetery for all of North Africa was lush and green. The city outside the cemetery was characterized by less-than-modern buildings and services and uneven surfaces; the cemetery grounds were neatly groomed and pristine. Even the white stone crosses were as fresh as though they'd been put in place yesterday, despite standing through years of watering of the handsome, drought-resistant lawn. Outside the cemetery grounds, we were becoming accustomed to being stared and snickered at for our foreign appearance; inside the gate we were Americans on American turf. Here we were in a sacred place of reverence and gratitude instead of mild confrontation. Here it was quiet, it was calm, and we were greeted by a huge black man with a welcoming smile and an authentic American accent. The cemetery was an unlikely oasis for us from the jostling of the Tunisian street scene and the worn quality of their urban environment. We'd dropped in on a whim because it wasn't far off our ancient Carthage circuit and it quickly became a high point of the day. 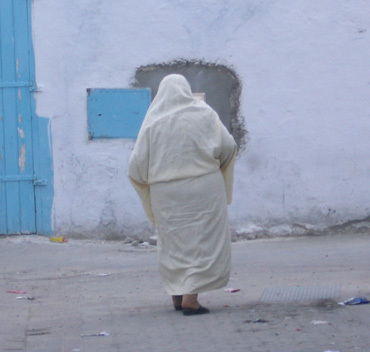 We'd come to Tunisia to learn more about the ancient history and yet welcomed the chance to reconnect with our own culture on its terms even though it was over a sad chapter in our history. We scanned the lists of MIA's under the portico and spotted a few from our native Oregon. Bill paused to remember that his uncle was one of the lucky ones, one of the ones who returned home to Oregon after the Africa campaign. We studied the outdoor ceramic tile maps at the far corner to view the war from the African perspective while on African soil. Bill, our resident war historian, had a new appreciation for Tunisia's strategic importance: just like us, the Allied forces took advantage of the small, 100 mile gap between Tunisia and Sicily, the narrowest gap between Africa and Europe. Our visit was a brief interlude in modern history from a US perspective and then we were back out onto the coarse surfaces of Tunisia, navigating poorly marked streets to find the ruins of the next Roman basilica and villas. Awesome! Partial & whole Roman mosaics everywhere you look. 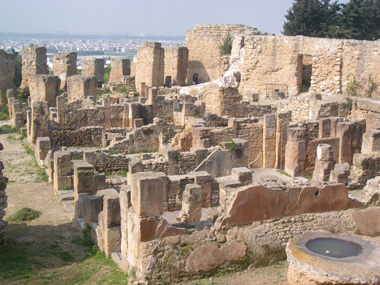 The Carthage tourist sites are quite spread-out and Bill wisely scheduled our visit over 2 days. He sandwiched in a trek in the opposite direction to the Bardo Museum in the Tunis suburbs between those visits which made good sense as some of the mosaics from Carthage are housed at the Bardo. Should you go to Tunisia, put the Bardo on your "must see" list. It isn't a top museum by any means but it does have the world's best collection of Roman mosaics--something we concluded must be true without reading the declaration. It is amazing to see sometimes massive mosaics all around you: on the walls, on the floors, and occasionally on the ceiling. And though we didn't study each mosaic carefully, we have become very admiring of their fabric-like appearance and the fine sense of detail created with rather crude ceramic squares. And as a former home owner, I envy the Romans for having had such durable, low maintenance flooring. 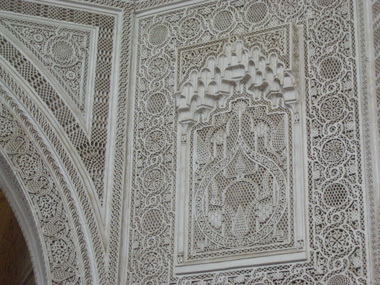 Ottoman-era plaster work from the Bardo's days as a palace. The other bonus at the Bardo is that it is like visiting the Roman and Ottoman Empires on the same day. Most of the Bardo's square footage is devoted to the mosaics but they are housed in an Ottoman-styled palace. 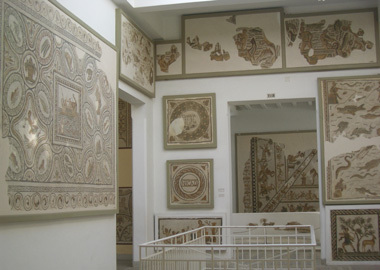 One minute the visitor is looking down at a huge Roman mosaic and the next minute your eye is drawn to a fantastically intricate wooden ceiling or plaster stuccowork from the 18th century. There is nothing to link the eras and you are left to abruptly bounce from one to the other. We walked miles to the Bardo Museum for the exercise and the experience of the city and had walked miles to see the various historical sites in sprawling Carthage. We'd surveyed the best of the Phoenician and Roman ruins and finds in the area and began assembling an understanding of Tunisia's more modern history. We'd meandered through the Medina, stared and been stared at, and had taken care of some modern electronics issues at a service center. It was time to move on, time to leave Tunis and discover other aspects of this small but interesting country. We are in Lipari town on Lipari island in the Aeolian Islands, a Mecca for island-seeking tourists we have read. It's northwest of Messina or near the eastern end of Sicily. We are parked for a week in a room with a kitchenette and terrace and are in the midst of day-trip island hopping as the wind will permit water travel. After that, we'll have to dodge 2 successive long holiday weekends--the first of which, Liberation Day, effects lodging availability 10 days in advance. So, like with Easter, our priority won't be sightseeing but being assured of a place to sleep each night for the following 2+ weeks. Bill has already decided that we can't see all of Sicily before the weather turns too hot for cycling so he's busy rationing the route between 'now' and 'next time.' Whenever it's time to shove-off from Sicily, we'll head north to the Italian island of Sardinia, of which we've just seen the northern tip. We'll slowly work our way north until the snows clear in the mountain passes in the Pyrenees and the Alps, which will be our summer destinations.